WOW! I have not used it yet but if it looks like that on my screen I love it. A surfers delight. Now all I gotta do is learn how...not. Awesome deisgn Libardo. Bravo and thank you . Could you make this a little bigger, can hardly see it. Very nice Dude!! Gnarley even!!! Hang Ten Surfer Dude!!!!! I just have one question, has a desktop theme ever been done based on a Cursor? Excellect job of this Libardo. Thank you friends ..I appreciate the support .well Brad61 I believe that I can't to make it bigger because I had erased some animations in the 3ds max format, was an accident. Philly0381 I haven't other themes that match with this cursor, only it was made to the contest. On the wave... sea, surf and sun. 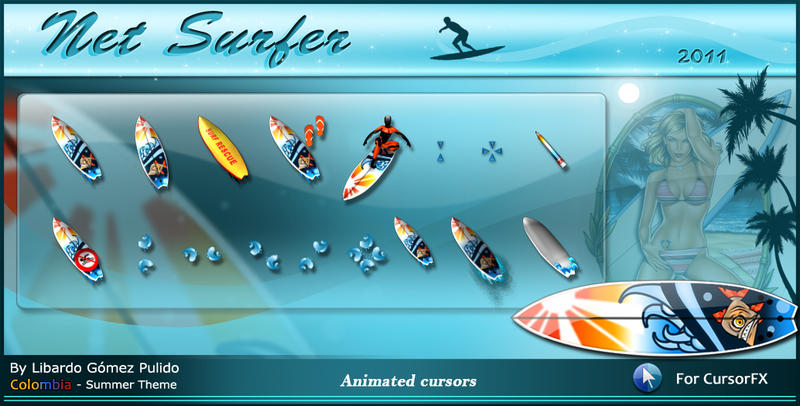 A wonderful cursor for the summer, let's go catch a wave!! for this, I like it very much. Great idea, and well done. Great work - luv it! Great cursor, thank you for sharing. from me.